My Well Thought Out Map of Panem. Districts of Panem. 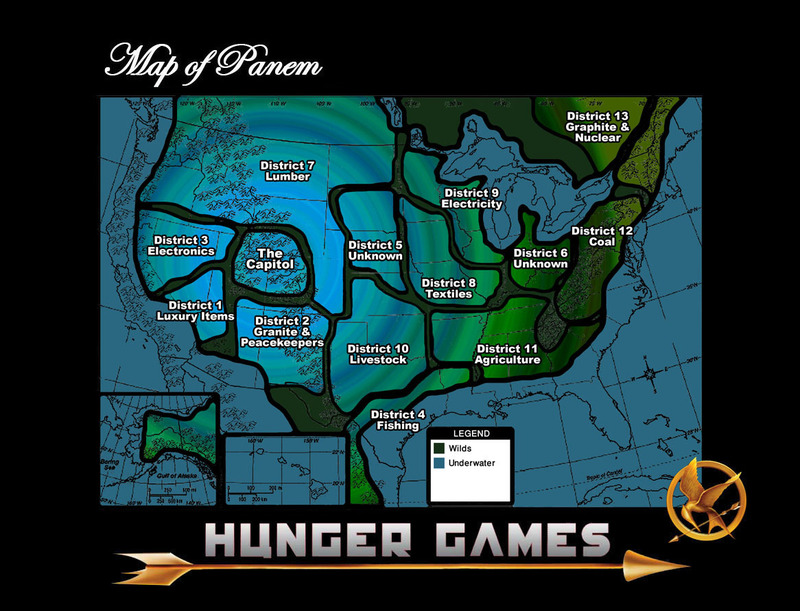 HD Wallpaper and background images in the Hunger Games club tagged: map of panem hunger games district 12 katniss. This Hunger Games photo contains anime, comic kitabu, manga, cartoon, and mkono. I like that Canada and Mexico are kind of incorperated :P I also like the space bewtween Districts. Awesome! wow.....crap...im in district 13 8( im blown off the maps!!!!!! living underground!! Yesssssssss, I am from district uno! I will never be in the hunger games unless i volenteer! Oh, I am also crazy rich. im.. nowhere??? CHICAGO ISNT PART OF PANEM?????? Wooohooo District 12! Team East Coast! Oh yea!! I'm in the Capitol!!! Go Colorado!!! Dis 5 is DNA stuff and dis 6 is medisine. Read the books more carfully!!! I'm right off the coast of District Twelve! great i'm in the capitol! does anyone know exactly where in the book it says what districts 5 and 6 do? I see that it's under water, but there are no trees in the part of Oregon in District 7. It's all desert. It should be Western Oregon, where all the trees are. This looks pretty good. The only nitpick is that I though district 11 was the largest, rather than 7, but I can still imagine Panem like this. Nicely done! District 7! Wow, I agree with most of this. Kudos for putting thought into it. Can I put this on my blog? this is awesome, I always had trouble picturing how the districts should be laid out. District 12!!!! I live in that little sliver of NJ. I'm still on the map! Awesome map! Most of the districts are where I thought of them to be. Very cool! I think i just escaped the water! LOL district 12 TEAMEASTCOAST! I'm living district 11.Well,I would have to because I'm black........Nooooooo!!!!Chicago!!!!! I literally live in 12 I live a few miles from coal mines. SO SUPER KOOL-AID!!!!!!!!!!!!!!!!!!!!!!!!!!!!!!!!!!­!!!­!!!­!!!­!!!­!!!­!!!­!!!­!!!­! im in twelve by the coal mines! so sweet!!!!! I am like right where they would hunt!!! wait isnt twelve the smallest???? Liked it, but why is Michigan underwater? Lakes Michigan and Huron area a good 570 feet above sea level and Lake Superior is at an elevation of 605 feet above sea level (I'm a Natural Resources major with a minor in surveying). Unless the Capital built the world's biggest dam (or someone cruel nuked the poor Upper Peninsula to bits) there's no way that the oceans rising would ever affect the Great Lakes region. I'm in the water or in 12 YEAH!!!!!!!!!!!!!!!!!! Im in 7 or 12 lol. I'm underwater!!!! I'm a mermaid finally!!!!! Sweet, district 1! I get it easy! Hey! At least i have no chace of being in the hunger games!! Then This Would Be me! im either in no district at all or in 6...? WHY IS FLORIDA UNDERWATER !!!!!!?????????!!!!!!!! I'm in District 12! Well almost, I'm underwater. Looks like it's time to move. Bottom of district twelve!!! WOOO! im in district 8. ill be rich! According to the map, either District Six or Underwater. I was born in 12. But I now live in 10. I would volunteer for Katniss. IM DISTRICT 12 Petta get ur lips ready for kissin!!! YaY! I live in 12! I live in NYC! Apparently I live in district 6. I'm in 13! In your face! I live with Katniss! Booyah! I'm in District 12, but District 12 is supposed to be where District 6 is, the Appalachians, in West Virginia. Why do all the fan made maps of Panem have been made with the premise that the whole planet is submerged and that the only landmass that exists is North America? It just makes no sense whatsoever just based on the fact that the books focus on Panem it's regime,it's second civil war and off course Katniss. it's the equivalent of reading about the deeds of Spartacus in Ancient Rome and then making a map of Ancient Rome with the rest of the planet submerged. It just doesn't make any sense whatsoever. HELLO?!? DISTRICT 11 IS MEANT TO BE THE BIGGEST - NOT 7!! !